If you're anything like me, you're already planning out your makeup for New Years Eve! Beauty tools can make or break a look, and a great set of brushes is one of the best grooming investments you’ll ever make. Thankfully, gone are the days when you had to drop a fifty on a single brush (yes MAC, I’m looking at you), and the Irish are leading the pack when it comes to great quality, affordable brands. NIMA Brush are one of my absolute favourites; they look great, they don’t cost the earth but most importantly, their tools stack up against the most pricey in my kit. If you watched my beauty gift guide video you’ll have seen me rave about the Elite Travel Set, €45, and the lovely folks at NIMA Brush have hooked me up with a set for you, too! Their NIMA Cleansing Mitt has also been making waves in the blogging community and the winner, plus two runner-ups, will also be trying that out. This eco-friendly microfibre tool makes it incredibly easy to take off your makeup – and there’s no cleanser required! This one is open worldwide so just pop your details into the widget below. Oh these look great! My own (cheap) drugstore brand brushes are a sorry sight already, so this would be a wonderful prize to win! These brushes look amazing! Thanks for the chance! I really want to try out these brushes! Thanks for the chance!I have too old brushes. Wow, lovely prize, I love new brushes! Another fab giveaway Emma! Dying to try NIMA brushes for myself, have the mitt and I love it! Hope you had a great Christmas! what a lovely set and prize! Great Giveaway, look like lovely brushes. I would love to try these brushes. They look great! Another neat giveaway - thanks Emma. I have an addiction to makeup brushes and these look fantastic! thanks for the brush giveaway; good brushes make such a difference. ooh what another great giveaway! Ooh, I've been meaning to buy a nice brush set for ages! I really like the colors of the brush, hope you pickk me bec I don't own a single brush yet. The Elite Travel Set & Mitts from NIMA Brush look great! The brushes look beautiful ! I wish you Happy Holidays and a Hapyy new Year! I am so keen to try the Nima brushes, have heard so many good things! A decent brush can make all the difference to how your make up looks. Great prize for whoever wins. Thank you so much for this chance! I think you are generous, and I love your blog! Fab prize, would love it please! Ive never tried this brand before but the brushes look great! Been wanting to try NIMA for months! Thanks for such an amazing giveaway! Awesome giveaway! A set of makeup brushes would be ace. i would love to have a set of good makeup brushes...and its great they come w/ a case, so they are portable when travelling. I'm in desperate need of some new brushes! happy new year,i would love to have your presents!!!! Would love to win..thank you! Great giveaway! I could use some new brushes! These look like really great brushes. these are very nice and portable, love it!!! My wife would love these. Let's hope for the best!! This is such a cool giveaway..!! perfect gift for my wife. :) thanks for this great giveaway. It's really great. Thank you. Wow! It's an amazing giveaway! Thanks for it! I want to win this for my sister who is a makeup fanatic. This would be a great New Years gift. Ah, this would be lovely! I love it!!!! nice giveaway.. thanks!!! Many thanks for the great giveaway!!! Wish you a Happy New Year!!! I would love to win it! Thanks for the giveaway. These look gorgeous! Would love to win them. I've been using the same brushes for way too long, would love to revamp my collection! 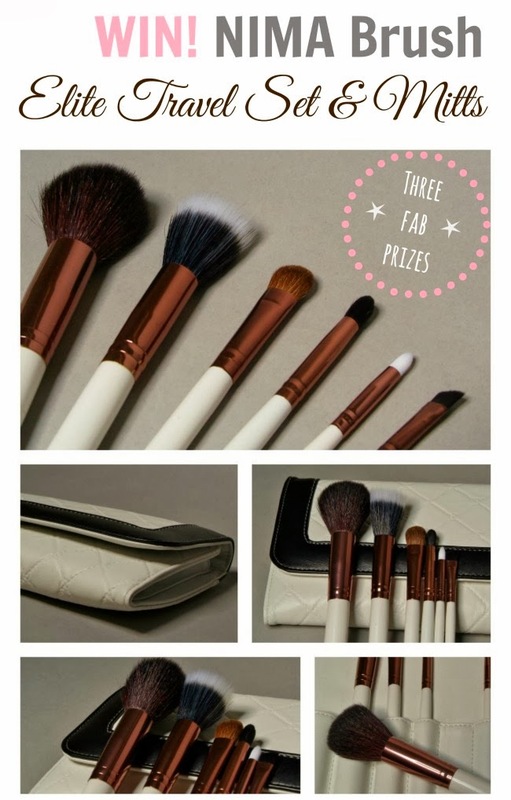 would love to win these so much my own brushes have seemed to disappear lately! These brushes look great. Good makeup brushes are hard to find. Thank you for the opportunity. Amazing brushes! Thanks for the giveaway! heard about this brand.. love that its irish! this is so cute - my daughter would especially love this, since she's very into black and white lately! Wow,this is amazing and so cute package.Thank you for the chance to win it,so generous of you. I want to win this for my sister who is a makeup fanatic. This would be a great New Years gift. It is a very nice giveaway. Thank you this is lovely! Finger crossed *_* love this set! Ooh what a lovely make up brush set! Awesome! I'd love to win this! I really like to win this set of brushes! Fab brushes, in need for prof ones and that just a bonus they're for travelling! Now this is a great giveaway! I own one brush & it's rubbish!